Bhadrachalam is one of the major pilgrim centre in Andhra Pradesh for Hindus. This city is famous for the temple of Sri Rama built by Bhakta Ramadasa during 1630 AD. Ramadasu was a devotee of Lord Rama. Temple Timings: 4:30 AM to 1 PM & 3 PM to 9 PM. The best season to visit Bhadrachalam is from October to March while the Peak Season is from March to April. 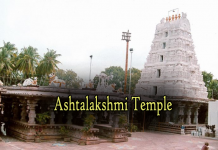 It usually takes one full day to visit all the places in Bhadrachalam. Temple accomodation nearer to the temple are available at a very reasonable rate. People who want a better kind of lodge can opt for private hotels. Budget hotels starting from INR 300 are available. It is possible to have booking the hotels for both temple and private in advance. Good south Indian food is available. 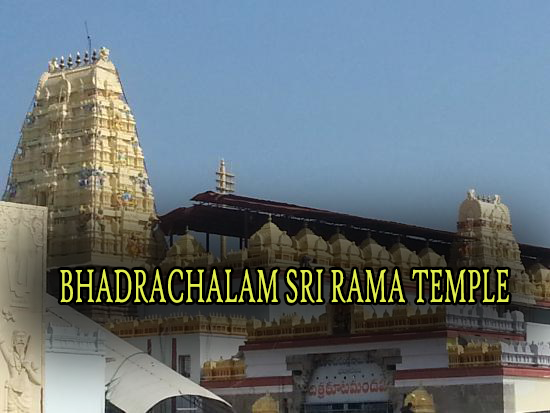 At a distance of 39 km from Kothagudem, 115 km from Khammam, 178 km from Rajahmundry, 182 km from Vijayawada, 352 km from Vizag and 312 km from Hyderabad, Bhadrachalam is a pilgrimage town in Khammam district of Telangana State, situated on the banks of the River Godavari. Bhadrachalam is renowned for the famous Sri Rama Temple built in 17th century and is one of the best Places to visit in Telangana. he Sree Seetha Ramachandra Swamy shrine at Bhadrachalam, the most famous temple in the country dedicated to Lord Rama, is situated on the left bank of the Godavari river. It is a place of pilgrimage for Hindus, considered to be one of the greatest holy shrines in South India with a very rich and unique historical background. The Temple was constructed in the 17th Century by the local Tahsildar, Kancharla Gopanna, popularly known as Bhakta Ramadas, a fervent devotee of Lod Sree Rama. The puranic and historic facts relate that Lord Rama long after he had shed his mortal coils manifested himself to save his devotee Bhadra Maharshi whom he promised ‘moksha’ after intensive prayer. That is why the village is named after Bhadra as Bhadradri or Bhadrachalam. Srirama appeared in a dream to a woman called Pokala Dammakka and informed here about the existence of vigrahas on Bhadragiri hills. To her surprise she found the “Vigrahas” and put up a modest structure. This was the origin of the present temple. he temple for Lord Rama was built by a devotee called Kancherla Gopanna popularly known as Bhakta Ramadasu in the 17th century. Gopanna was the Tasildar of Bhadrachalam and constructed the temple using public donations. But the Golconda Sultans were misled and felt that Gopanna had misused the government funds to build the temple. He was imprisoned in a dungeon at Golconda Fort. Lord Rama is said to have miraculously appeared before the Sultan and paid the money spent by Gopanna, after which he was released. Gopanna then became Bhadrachala Ramadasu and went on composing several songs in Telugu in praise of Rama. Kabirdas, the famous Muslim saint and poet, was also closely associated with this temple. This holy town with beautiful landscapes provided by River Godavari attracts several devotees throughout the year from different parts of Telangana and AP states. This holy river houses most of the sacred shrines of the town in and around its banks. The Ushnagundam (Hot Pool) or Gundala is located at a short distance from the Temple. Parnasala, 35 km north of Bhadrachalam, is believed to mark the hermitage where the demon Ravana abducted Sita. Tourists can engage in activities such as boating, trekking and a trip to Papikondalu. The 10-day Vaikunta Ekadashi (Dec/Jan), Sri Rama Navami (Mar/Apr) and Kartika Poornima are the important festivals celebrated at Bhadrachalam temple. During these days, the town attracts lakhs of devotees. On Vaikunta Ekadashi day, the colorful Teppotsavam (boat festival) is a special attraction. In the evening, Lord Rama and Sita idols kept on a decorated swan boat and sailed through river Godavari. Spectacular fireworks are the main attraction during this festival. Bhadrachalam has good accommodation facilities provided by several hotels spread across the town. The Rajahmundry Airport (185 km from Bhadrachalam) has limited domestic services from Chennai, Madurai, Vijayawada, Bangalore and Hyderabad. The nearest Railway station, Bhadrachalam Road (Kothagudem) is 39 km from Bhadrachalam. It has trains from Hyderabad, Sirpur, Manuguru, Kazipet and Dornakal. Bhadrachalam is connected to various places like Kothagudem, Hyderabad, Khammam, Warangal, Kakinada, Vizianagaram, Karimnagar, Rajahmundry and Nalgonda. From Burgampad, boats can ply to Bhadrachalam through the River Godavari. Boats are operated between Bhadrachalam and Rajahmundry during post monsoon season.